I found this cover on ebay but didn't actually buy it. I thought it was very striking. It has beautiful colors. 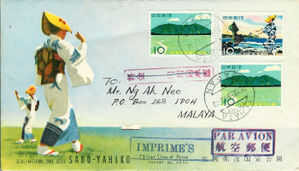 A cover is an envelope with cancelled stamps on them. Some are everyday mail with interesting cancellations. Some are preprinted and used to commemorate a stamp issue. Those are called Cachets. Special postmarks are created at the station where the stamp is first issued. It's just more stuff. Stamps are small, easy to keep safe, you can get a lot on a page of an album. Covers are envelopes and a thousand covers eats up the square inches. Virtual collecting is often fine with me. Saves a lot of cubes and often it seems nearly as real as the paper version. I wonder who Mr. Ng Ah Nee is? Why does he not have his cover? I bet he'd croaked it and his family sold his stuff. That's what I'd do. That's the cycle of life. I like repetition. I like multiples of the same image. So stamp collecting has this added bonus feature in sheets of stamps. I have a few, but not this one. I liked the penguins. Who doesn't like penguins? I'd go with the paper ones, less poopy. 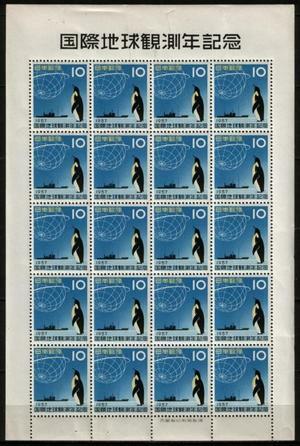 This is a stamp to commemorate the International Geophysical Year of 1957. I don't know what the hell that is. I just like the pictures.